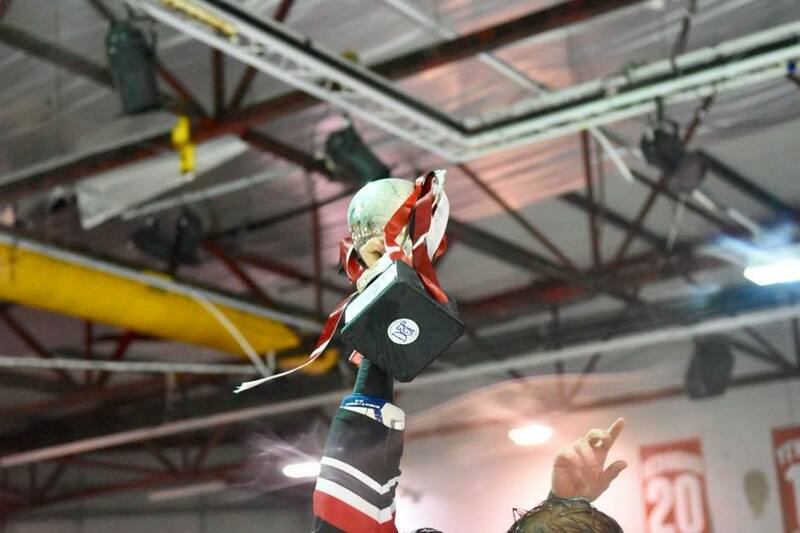 The Sherfield School Basingstoke Bison entered the weekend with two games standing between them and the Briton Conference Play-Off Championship plus the top seeding from the South for the following weekend�s National Finals. The weekend started on the road for the Herd as Doug Sheppard�s men lined up in Bretton against league runners up Phantoms and at 7pm Tim Pickett took charge of the final game of the season in Peterborough. A tight scoreless first period saw Phantoms edge the 13 shot count by a single shot but in the second period at 31.33 Tomas Karpov put the visiting Bison ahead finishing from Josh Smith and Kurt Reynolds as the Bison outshot the Phantoms 15-8. After a goal washed out for the Bison with the referee adjudging the puck to have crossed the line after the metal work had come free from it�s moorings Phantoms snuck back into the weekend tie when Nathan Salem scored at 54.55 to end the first leg 1-1 and leave all to play for in Basingstoke the following night. With the away leg ending tied the action moved to the home of the Sherfield School Basingstoke Bison for the final leg with the winner lifting the Play-off Southern Trophy. Bison were missing Joe Baird while Phantoms were without Darius Pliskauskas, Dan Lane and Owen Griffiths for the final game. Starting goaltending duties went the same as the previous night as Dean Skinns and Euan King guarded the pipes for their teams. Stephen Matthews was in charge of the final game in Basingstoke for the season with Andy Cook and Flynn Sitch-Cunningham on the lines. Roman Malinik was looking dangerous early on and he and Kurt Reynolds combined in the opening moments of the game. Soon after Ryan Sutton collided with the linesmen ending his solo run. The first five minutes saw the teams feeling each other out but neither could break the deadlock. Chances continued for the Herd as Grant Rounding fed the puck off the boards to Roman Malinik who sped up the middle but a sharp low save from Euan King ended his chances. Good two way play by Tomas Karpov broke up a Phantoms offence and found Stuart Mogg who fed Dan Davies but a short side chance was well covered by the positioning of Euan King and he again shut the door. King couldn�t repeat the feat at 10.07 when speed gave the Bison a 3 on 2. Dan Scott�s laser pass found Grant Rounding and Roman Malinik moved to prime position in front of the net. Rounding found Malinik waiting at the far post and there was no answer except goal to Malinik�s shot giving the Herd the lead on the night and on aggregate. Bouyed by the goal Bison pressured around the net and Tomas Karpov desperately searched for a rebound chance in front of the net but just couldn�t squeeze the puck past or under Euan King. A powerplay went to the Phantoms when Ryan Sutton took a hooking penalty at 11.59. Phantoms thought they had a good chance of equalising as Dean Skinns took a look behind him as he squeezed his pads shut on a Nathan Salem 5 hole chance but the puck was wedged in between the legs as the whistle blew. A good Phantoms powerplay tested the Bison but failed to breach the net and Ryan Sutton returned at 13.59. With 5 on 5 the order of play the net came lose behind Euan King after a period of Bison pressure which saw the referee engage in some words with the Phantoms goaltender. A dramatic save from Euan King denied a Kurt Reynolds blast and soon after a more conventional save rewarded Elliot Dewey with the same result. A freaky bounce on a clearance round the boards saw the puck dangerously bounce out and onto the stick of Nathan Salem but his shot was blocked and Bison cleared as the 19th minute started. As the first period ended Leigh Jamieson barged Roman Malinik and in the ensuing gathering Greg Pick hauled down Vanya Antonov provoking Dan Scott to step up to offer calming words. The referee then directed everyone from the ice. As the second period started Greg Pick begun his roughing penalty giving the Bison their first powerplay of the night. A blocked shot saw James Ferrara race away solo and in on Dean Skinns who made a huge, crucial save. Chances then came or were blocked at both ends before an error by Euan King was only saved from being critical by Glen Billing. King left the net and slipped leaving the target open and Tomas Karpov rounded the net but his attempt at a wrap around was hampered sufficiently by Billing�s persistent defence that the threat was waived. Dan Davies slid the puck to Vanya Antonov but King was sharp however the Phantoms found the Bison shotstopper in the same form as he denied Scott Robson. Aaron Connolly got a couple of chances before Will Weldon grabbed a chance at the other end but all of them came to no avail. As the midway mark came and went Bison were still ahead by their single goal and despite the second period chances so far there had been very few quality chances compared to the first period. At 31.20 Ales Padelek levelled the game when Leigh Jamieson found him and he managed to poke the puck through the tiniest gap between Dean Skinns and his post. Dean Skinns produced a huge save on Glen Billing and Bison cleared the puck to Vanya Antonov who�d handed his stick to Skinns earlier so ended up racing down the ice with no stick but he did enough to retain possession in the corner while the Bison changed lines. A Dan Davies pass at 32.54 was perfect for the racing Roman Malinik who steamed in and redirected the puck through the 5 hole and into the back of the goal for the lead back to the home team. Leigh Jamieson�s effort to equalise came to nothing as he directed his shot straight at Dean Skinns. Aaron Connolly and Roman Malinik combined with the former taking the puck into the zone and the latter letting off a backhand but Euan King�s glove save held the puck. Josh Smith headed off to the dressing room and as Dean Skinns made a save James Ferrara and Dan Scott ended up exchanging more cross words. On the restart Phantoms tried to sneak a late change but couldn�t get that past Stephen Matthews who restored order. As the second period buzzer was about to sound Dean Skinns saved Salem and Salem�s rebound keeping the Bison the lead. Josh Smith returned for the third period however Grant Rounding appeared back in his regular clothes. Dan Scott started the third period picking up a boarding penalty at 41.07 but an uneventful powerplay followed and Scott returned two minutes later. Tomas Karpov advanced and fed the puck to the net for the advancing Vanya Antonov but Euan King grabbed it before the Bison man arrived. Two Phantoms chances came as Nathan Pollard tried to beat Dean Skinns 5 hole but he closed the gap, and soon after made a stop from Ales Padelek. After a shot from Kurt Reynolds the home fans jeered as the net came lose behind Euan King. A quick give and go between Dan Davies and Roman Malinik saw the final pass evade Malinik. A couple more chances came for the Bison before Nathan Salem crashed the Bison net but couldn�t get past Dean Skinns. A tense moment happened for the Phantoms when Tomas Karpov was checked just outside the crease and as he went down it looked like caught Euan King�s helmet with the skate. King took a moment or two to recompose before re-starting the game. Phantoms attempted to go with James Ferrara, Ales Padelek and Glenn Billing but Dan Davies got his stick in the play and deflected the pass to Billing out of play. On the restart Roman Malinik found Vanya Antonov who fed Dan Davies but in making the save Euan King took the net off again! In the final 5 minutes Phantoms tried to out muscle the Bison. James Ferrara and Dan Scott exchanged more words before Leigh Jamieson tried a one timer which Dean Skinns saved with his pad before covering the rebound. With 1.08 left to play Phantoms coach Slava Koulikov called his team back for the time out and on the re-start Euan King remained on the ice until Phantoms had control. He left quickly which allowed the visitors an extra skater. He was forced to return when an icing call was made incorrectly as Stuart Mogg flicked the puck down the ice but it took a clear deflection on the way from a Phantoms glove. Face-off was at centre ice and King was forced to return. He did make his way from the ice again and took no further part. Bison iced the puck with 1.2 seconds to play and when they won the face-off that was enough to secure the NIHL1 Britton Conference Play-offs to add to the NIHL1 Britton league.